An invitation to a photographic exhibit. 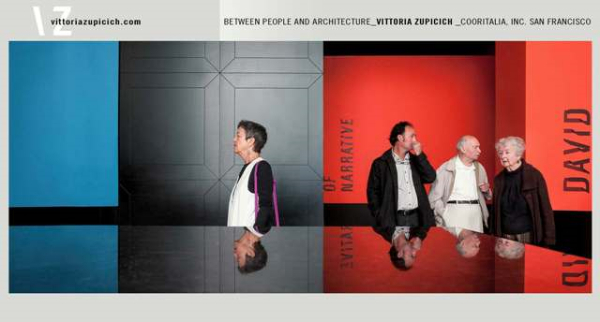 An invitalion to the exhibition "Between People and Architecture"
Join us for the exhibition "Between People and Architecture" by Vittoria Zupicich at CoorItalia's showroom! CoorItalia is very excited to invite you to Vittoria Zupicich’s photography exhibition, held in our new showroom in the San Francisco Design District (151 Vermont Street), from June 2nd through June 30th 2015. On Thursday June 11th, from 6pm to 8pm, there will be the "Meet the artist" event at CoorItalia. Please RSVP paula@cooritalia.com if you would like to attend this evening, otherwise feel free to stop by any other time during business hours. Vittoria Zupicich’s images are inspired by small details of everyday life and this exhibition, entitled “Between People and Architecture”, shows how architectural space is where people move and interact with the architectural design. Check out our blog post to know more about the artist and her vision. This event is organized by CoorItalia, with the support of the Italian Cultural Institute of San Francisco. CoorItalia Architectural Elements Division has a passion for design and architecture. Direct from Old-World suppliers, we build quality custom stone pieces that will beautify your home. There is a reason that dozens of high-end home designers and landscape specialists turn to CoorItalia to produce custom staircases, fireplaces, and flooring. From detailed design blueprints to workshop construction to master artisans finishing the decorative elements, we pay attention to detail every step of the way. Copyright © 2015 CoorItalia, All rights reserved.